We have a limited supply of the official 75 years bag featuring 75 years F.A. Porsche emblem and autograph print. 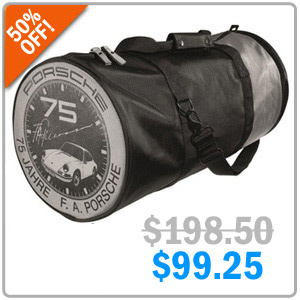 Large enough to carry sports gear and comes with a removable shoulder strap. Now for a limited time you can take 50% Off when you use Promo code POR50 at checkout! This offer is valid through August 23rd so don’t miss out as these go flying off the shelf! Last edited by Luccia at Pelican Parts; 08-10-2017 at 07:33 AM.